WHEN flood waters tore through the Lockyer Valley in January 2011 people weren't its only victims. With thousands of animals suffering one Lockyer Valley vet did everything she could to help. Dr Louise Cosgrove was only new to the Valley before the floods. And yet her actions during them saw her given a commendation normally only restricted to a few retiring vets. 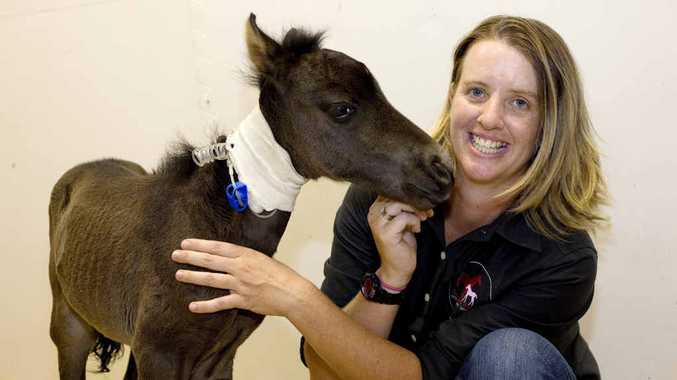 The Australian Veterinary Association (AVA) awarded Dr Cosgrove a Distinguished Service Award, after she attended to close to 100 stranded and injured horses across the flooded Valley. As water flooded the Valley horses were hit by the flood if they couldn't reach higher ground or stranded there if they could. "The phone started ringing on the Tuesday," Dr Cosgrove said. "On Monday the wall of water came through the Valley and on Tuesday people woke up to find their horses missing, dead or dying." Despite a four-month-old son and a 20-month-old daughter at home Dr Cosgrove hit what was left of Lockyer Valley roads to help as many horses as she could. "It's hard to tell with how much was going on at the time, but I'd say there were at least 100 horses I saw in about a week. "We got to places along the roads that we could, we even had to travel along creek beds to get to where the horses were." Dr Cosgrove was even airlifted by the RSPCA into areas that were inaccessible by road to help stranded animals. "These places were completely cut off. "There was just no way of getting there other than a helicopter." Many were suffering from cuts and lacerations after being washed through fences or tree lines. Others, having inhaled flood water were ill with pneumonia. She patched up what she could and evacuated the horses from the area. "We sent the horses to UQ," she said. "It became a pooling area for them, where people came and picked them up from later on." The university, relatively safe from the floodwaters turned into a sanctuary for the horses during the flood. "UQ and the drug companies were just fantastic in their support. "I ran out of drugs and bandages really quickly, I wasn't charging for them and didn't even think about that, and I went to UQ, as a newcomer who they didn't really know, and said I need help and they gave it to me." She went through not only her own supply of bandages and certain drugs but UQ's as well. Despite her best efforts many horses were beyond saving, and with them trapped in flood waters Dr Cosgrove was forced to euthanise a number. While Louisa was in the field her husband Jason Gray was at home, taking care of their two young children. "I wouldn't have been able to do what I do if it wasn't for him," she said. With breeding season occurring at the same time as the flood, she had to work 24 hours a day to ensure pregnant horses were surviving. One mare was scheduled to give birth as the flood waters swept through the Valley. Despite having to attend to stranded and injured horses across the Valley, and having to maintain constant overnight vigilance on the pregnant mother, Dr Cosgrove successfully birthed foal Mia. Yet, over a year after the event, when named the recipient of the Distinguished Service Award, she doesn't think she went above and beyond the call of duty. "I think anyone in my profession would have done it. It's my job. "That's why the award is so humbling, because I know anyone would have done it." It's not a sentiment her husband shares. "She's far too humble," he said. "This is an award that 98% of vets will never receive and most who do get it at the end of a long career. "And something else she'd never mention is that the award is peer chosen by other AVA vets, making what she did even more impressive if you ask me." But no-one else in the Valley's actions during the floods attracted the attention of the AVA Veterinary Emergency Taskforce chairman Dr Gary Wilson. Dr Wilson nominated her for the Distinguished Service Award stating "in order to treat these animals Louise often had to put herself at risk and wade into flood waters. "It was heartening to see the rapid voluntary response of AVA veterinarians who quickly came to the aid of distressed animals and their owners. "This was especially true of some of the younger generation of veterinarians and was typified by the extraordinary efforts of Louise Cosgrove, a private practitioner in the Lockyer Valley district. "I am amazed but not surprised at the enormous workload that Louise undertook in those difficult times and am extremely proud to be a member of the same caring profession." Now working out of a new horse specific veterinary facility near Laidley life has all but returned to normal for Dr Cosgrove. However, her new Exclusively Equine Veterinary Services, off the Warrego Hwy near Hatton Vale, still has horses that were hurt during the flood. One horse in her care suffered horrific cuts from the floods and had to be taken from its owners after they refused treatment.